What did I say last week? QR codes are “coming of age”, and they are here to stay. Somewhere in Seattle, people are using QR codes on their tombstones and the tombstones of their loved ones so that they can preserve memories in more tangible forms. Morbid as it may seem to some, I think it’s one of the more creative and useful uses of technology. If you disagree, then you might be more interested in another application of QR codes, which seems to be gaining traction. A project called QR-3D ((QR-3D Site)) is up and running and looking for participants. 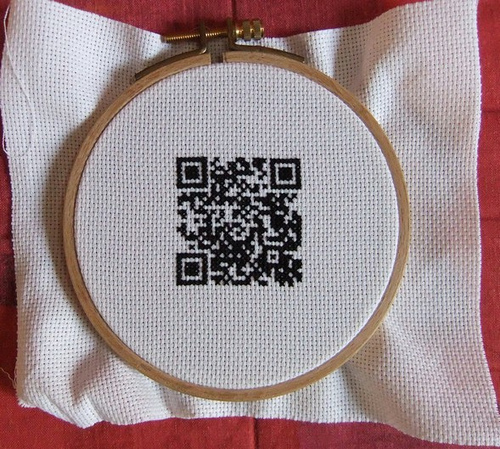 This project has a simple aim – to see if textile versions of QR codes will work. It does not take much effort to realize that textile QR codes can take on a wide variety of forms, as there are so many ways by which you can place a design on fabric. There is screen printing. Then there’s cross-stitching (or plain old stitching). How about quilting? Knitting? The possibilities are boundless, and one can easily see how this project can open up the doors of your geeky creativeness – or creative geekiness, whichever you prefer. The project is being curated by Sally Fort, who poses the challenge to textile artists and geeks to come up with all sorts of ways to integrate QR codes into their work. Anyone can participate in the project, and if your work is chosen, it will be included in the QR-3D exhibit at Cornerhouse, Manchester, UK. This will be held later this year, in autumn. What makes me excited about this development is the possibility of having QR codes (with real “meanings”) on t-shirts. Everyone’s wearing quirky, geeky shirts. Bring out the next big thing – QR codes shirts that need to be deciphered! What do you think? I love geeky, quirky t-shirts. I have started printing my QR Codes on t-shirts with different designs. Check them out on my website. I plan to design some more and will upload the pics on my blog.